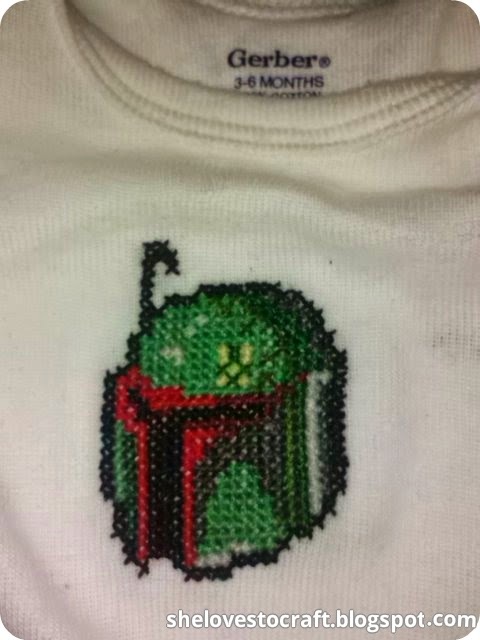 We are HUGE Star Wars fans in this house, and last night I found an awesome free cross stitch pattern for Boba Fett's helmet. I received a package of plain cotton Onesies from a friend at my baby shower, and I immediately knew what I would use this pattern for. My son , who is due in one month, will need a Bobba Fett shirt, won't he? I've never, ever cross stitched on knit fabric before, even though I have been cross stitching on and off for about 20 years now. I have had this stuff called 'waste canvas' in my supplies for 6 years or more, and I thought it would be great for this project. Waste canvas is a very loosely even weave fabric that resembles AIDA cloth. It is perfect for cross stitching on knits or any other fabric that doesn't lend itself to cross stitching easily. Cut a piece of waste canvas that is slightly larger than your finished design, a half inch for a design that is a couple square inches would work nicely. I don't recommend doing large, complicated designs. Small and simple are best. Center your waste canvas on the item you wish to stitch your design on, and pin the fabrics together. Getting your waste canvas centered is seriously the hardest part. Use basting stitches along the outer edge of your waste canvas to keep your waste canvas and base fabric together. You can even do a grid of basting stitches to help you stitch your design. I like to do a grid of 10x10 stitches. Stitch your design, using the grid of the waste canvas as a guide, like you would using AIDA or another even weave. Once you have finished your design, I like to clip larger pieces of the waste canvas away using a pair of tiny pointy scissors. Make sure to leave at least a quarter inch of canvas along all edges of your design. Using a sponge or a spray bottle, dampen the waste canvas. You want to make sure that it is thoroughly wet, but not dripping. Using tweezers, start at the top of your design, and pull the very topmost horizontal thread from the waste canvas. You should be pulling straight out to the right, parallel to the fabric (if you are right handed. If you are left handed, pull to the left.) Be gentle, and be patient. After you have removed all of the horizontal threads of waste canvas, start removing the vertical threads. Pull downward gently, parallel to the fabric. Keep removing them until they are all gone. Gently press your design, using a setting that is appropriate for your fabric and thread. If you'd like the pattern, you can find it here at Cross Me Not. You can find a TON of other great cross stitch patterns there, including a Stormtrooper helmet and a variety of different lightsabers, as well as a ton of other great nerdy ones.